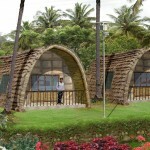 Adyar wetland reserve and the Poonga Ecopark is an environmentally significant project proposed in the city of Chennai. 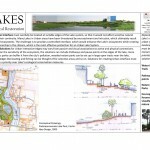 Idea Design worked on this project as landscape architecture and urban design consultants with Mr. Joss Brooks, renowned ecological restoration specialist of Pitchandikulam Forest Consultants, Auroville. A combined fresh-water / salt-water ecosystem was to be revived to make it an ecologically rich and diverse system for migratory birds and estuarine ecosystems along with coastal vegetation being the significant link to tie them together. Environmentally sensitive approach is given for the water and waste management. The sewage and waste water which flows from the city to this creek is treated using ecological techniques. Each aspect of the park demonstrates a strong commitment to the environment. 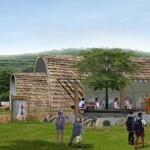 An ecoforum is proposed where man can interact and interpret different ecosystems of the park. The park will also become a center for education and environmental awareness. 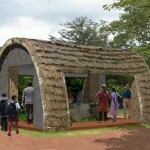 Demonstration of working models of sustainable technologies for human habitation is another important feature of the park. 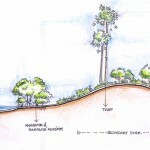 Idea Design worked as part of the team who prepared the Ecological Restoration Master Plan. 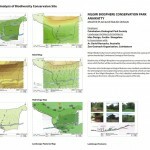 The Project was implemented by Pitchandikulam Forest Consulatnts and Idea Design provided detailed design services working together with ecologists from PFC. Once a garbage and debris dumpsite, the park has recently recorded more than 100 species of birds, 56 species of butterflies, 25 species of reptiles and 30 different species of fish. The white-bellied sea eagle for the first time in these parts a month ago. Flamingos and painted stork have also returned here. This richness in biodiversity is in itself an indicator of the success of our restoration efforts. A total of one-and-a-half lakh saplings of 200 indigenous species of plants have been planted in the restored area. Being a brackish water ecosystem, seven different varieties of mangroves were planted on the site, and attempts have been made to restore the estuarine wetland ecosystem. Nilgiri Biosphere Conservation Park is a project by the Coimbatore Zoological Park Society. 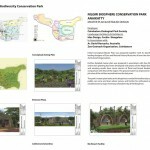 Originally conceived as a Zoological Park at the beginning of the park in 1992, the project, over the period has transformed into a biosphere conservation project. 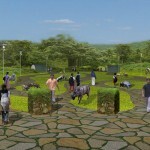 The park located in Anaikatty at the foothills of the Western Ghats is planned to exhibit various ecological zones of the Nilgiri Biosphere. First step of this was achieved through the identification of various biological zones such as evergreen, moist – deciduous, dry deciduous, thorn forest etc and planted in ecologically suitable location within the park. Interestingly, over the period of 15 years the ground water of this area has increased, and PH value of the soil, which was alkaline has come back close to neutral. Idea Design Team has been working on this project in association with renowned zoo and botanical garden designer, Ar. David Hancocks of Australia on conceptual stages of design and renowned zoo personality, Ms. Sally Walker of USA on technical aspects of setting up this nature park and later went on to prepare the detailed master plan document for the project which is being implemented in phases. Wetland Park a conservation and research centre for Wetland eco-system, its flora and fauna is proposed in one of the islands in the Vembanad Estuary. The park itself will be a live demonstration centre for wetland ecology, mangroves, life cycles of its avian, terrestrial and aquatic fauna. 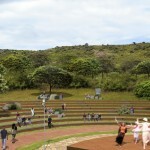 The project consists of an interpretation loop comprising of walkways, boardwalks, hanging bridges and a parasol ride. A wetlnd interpretation centre is proposed, where initial orientation will be given to the visitors. 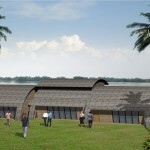 The eco-sensitive design of the interpretation centre follows the theme of traditional boat architecture. A wetland resech station is proposed in the site, which will become an on-site research station for the department of environmental studies at the local university. 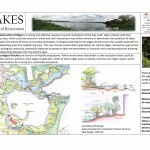 Idea Design had worked on a conceptual presentation for Ecological Restoration of Lakes, primarily prepared for Lakes of Bangalore, but applicable for Lake Systems of the sub-continent in general. 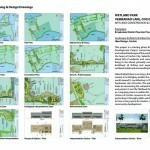 The presentation looks at restoration from a regional planning level to restoration of edges and mosaic of ecological-patches and finally to the lake’s urban interface and landscape solutions. 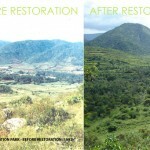 A comprehensive landscape planning approach will only ensure the success and longevity of restoration. Each lake will have its own ecological and urban context, both of which have to be studies and carefully dealt with to come up with solutions which are sustainable.